While I was researching for a possible post on legalizing MMA in my home state of New York, I stumbled upon an old story (news to me!) 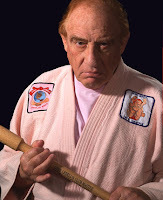 about the grappling great Gene LeBell. Apparently, yesterday was "Judo" Gene's 83rd birthday, so to commemorate the event, the tale of his bout with a professional boxer has been popping up on MMA sites. Judo … is a complete fraud. … Every judo man I’ve ever met was a braggart and a showoff. … Any boxer can beat a judo man. Judo bums hear me one and all! It is one thing to fracture pine boards, bricks and assorted inanimate objects, but quite another to climb into a ring with a trained and less cooperative target. My money is ready. Where are the takers? The writer, one Jim Beck, obviously had judo confused with karate or something else, as if that would have mattered to him or most of his readership. Beck supposedly was an amateur boxer of some renown and claimed to have beaten a judo player using his boxing craft. So Beck promised to pay 1000 dollars to any "Judo Bum" who could whip him in a match! LeBell, a former two-time US judo champ, was tipped off about this offer and jumped at the opportunity to fight an amateur boxer for a cool grand — serious money in 1963. 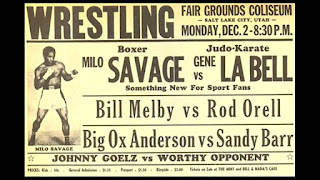 The match was arranged to be held in Salt Lake City as this type of mixed event would be either unsanctioned or illegal everywhere else. 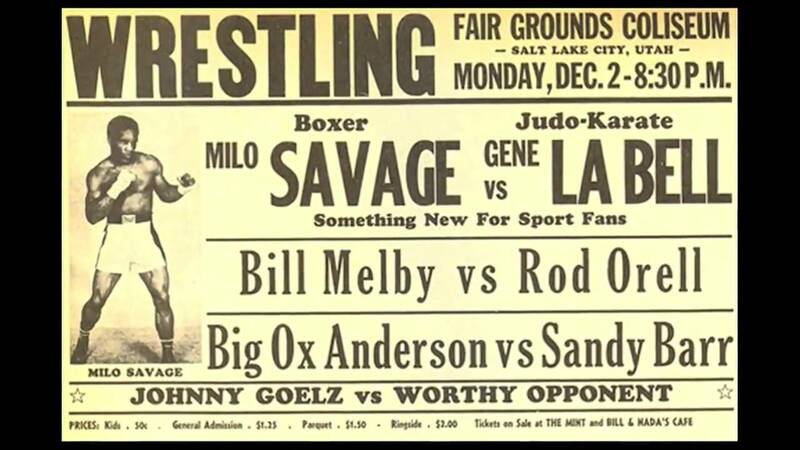 At the last minute however, Beck sobered up to the prospect of duking it out with the likes of LeBell and substituted himself with a ringer: former middleweight contender Milo Savage. Savage's professional record was 49-46-9 and was 39 years old (LeBell was 31). He was an over-the-hill journeyman, but had beaten some highly regarded fighters in his day. There was even a rumor that Savage had broken the jaw of a local karate instructor during an impromptu match. The rules for the scheduled 5-round bout were that punches and grappling were allowed, but no kicks. LeBell was barefoot and donned a judo gi while Savage wore lightweight speed-bag gloves, but also wore a gi top, as requested by LeBell's handlers. As the bout started both men were naturally leery of each other and managed to avoid any type of wild clashes. By the fourth round LeBell began to warm to the the task and finally closed the distance. After grabbing Savage he executed a hip throw with a sweep, taking him to the canvas, then finished him off with a rear choke hold. Not knowing how to tap out or signal quits, Savage was rendered unconscious and remained so for about twenty minutes. Pandemonium ensued as fans hurled garbage and chairs into the ring, likely because it was assumed their hometown fighter had just been killed! Savage only fought one more time before he officially retired from boxing. For LeBell, it was a defining moment for judo — and really, martial arts in general. LeBell would become a sought-out stuntman and stunt coordinator for Hollywood, working on on hundreds of movies and TV shows. Today, he is highly respected by martial artists all over the world. In conclusion: Never mess with someone nicknamed "The Toughest Man Alive" and who is secure enough to wear a pink gi.